Hannah Hauxwell (1926 – 2018) was an amazing woman who lived on a remote farm in Yorkshire almost entirely cut off from the outside world until a TV documentary was made about her in 1972. She died in February last year and next month Tennants will be auctioning the quilts from her house. You can find out a little more about the quilts (and Hannah) in this blogpost from UK Quilters United. “Both Grandma and Mother were clever with their hands, making mats and quilts. Grandma laboured for years with her frames and turned out all the mats for the house. I have still got two quilts that she made, which have been in use for as long as I can recall. Mother knitted a white cotton quilt before she married, which I treasure to this day. I have done a bit myself, but possess neither the ability nor the patience to do fine work. I prefer thick wool which gets done rather more quickly, and during the war I unravelled some of Grandma’s things and knitted them up again“. This ‘Grandma’ was probably her paternal grandmother Elizabeth Hauxwell (nee Bayles) (1862 – 1940) as one of the quilts has the initials EB embroidered on the back. Her maternal grandmother was Ann Sayer (nee Tallentire) (1853 – 1930) and it is unlikely Hannah would remember her as she would have only been about four when Ann died. Hannah’s full name by the way was Hannah Bayles Tallentire Hauxwell thus showing her ancestry through her middle names – an absolute gift to genealogists! We rather liked this six-pointed star quilt from the ones being sold and as Chris has drafted some templates to make something very similar (download them here) Barbara may have a go at making if not an entire quilt then perhaps a cushion or table runner. Rumour has it that a stash has been picked through, fabrics assembled and pieces cut for a test block or two. You’ll notice that the original shows identical fabric placement from block to block but we think this charming star and square pattern would look just as good in random scraps. 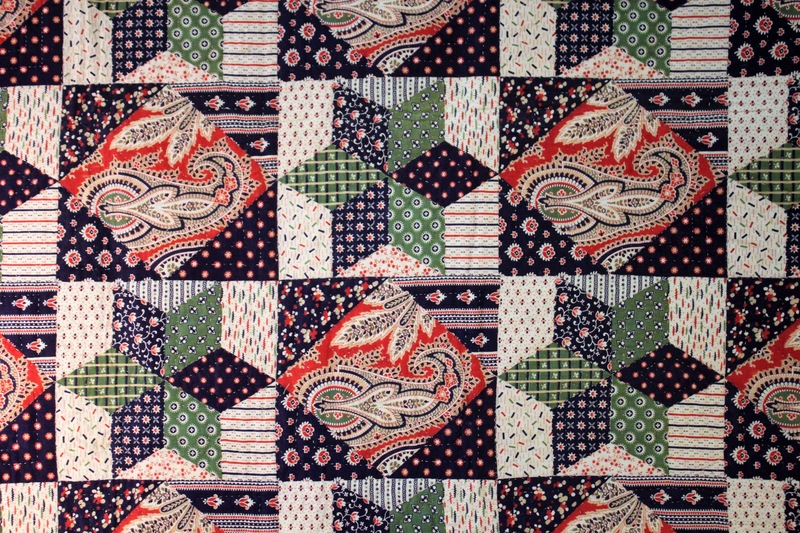 This entry was posted in Free patterns, heritage quilts, vintage quilts by Chris. Bookmark the permalink.